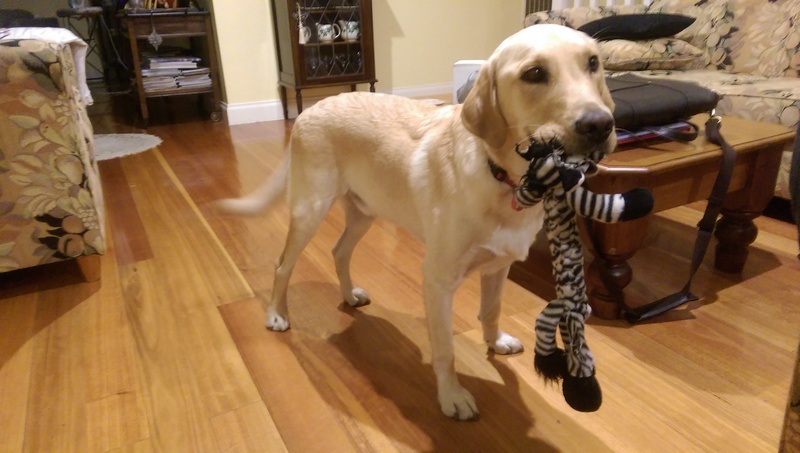 In September 2015, we introduced you to two year-old Labrador, Brody. This happy young dog came into the Home with a severely dislocated hip, which required surgery at the Frank Samways Veterinary Clinic. You can read Brody’s story here. Quickly becoming a favourite of many staff members at the Home, we were happy to see Brody go on to find his forever family with new owner Alyssa. In our Adopted & Adored inbox today, we are sharing Alyssa’s update on bouncy, lovable Brody, now known as Cheddar. I just wanted to send you an email to let you know how Cheddar is going now, six months after we adopted him from The Lost Dogs’ Home. 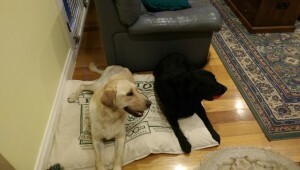 I visited Cheddar at the Home for the second time with my boyfriend’s Labrador who is quite shy and they seemed to get along ok on their first meeting but it didn’t take long until they became best buddies. They seem to be so excited when they see each other now, playing nonstop. As we had another dog in our life who Cheddar would be around a lot, we needed to make sure they were compatible. Bringing our other dog to the home to meet Cheddar was a great recommendation from The Lost Dogs’ Home. I noticed Cheddar’s friendly nature towards the staff at The Lost Dogs’ Home and was confident my whole family would love him as quickly as I had within only two short visits. It was important for me to adopt my next dog. Adoption has been a great experience and one I would recommend to anyone who is seeking to bring a new canine friend into their life. 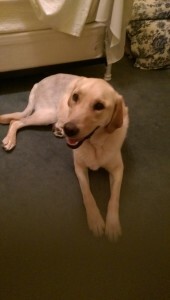 I was looking for a playful dog to adopt and I have a love for the cheeky Labrador behaviour and Cheddar has definitely fulfilled that. We are forever being entertained by Cheddar; it is never a dull moment in his company. When we first took Cheddar to the beach it was obvious that this was a new experience for him. Now when Cheddar is at the beach, he runs up to every fisherman, every other dog and runs in and out of the water. Other beach goers laugh at his excitement for the waves and most of the time seem to enjoy him greeting everyone on the beach. We have encouraged him to swim out with us to help with his fitness. When I brought Cheddar home he was recovering from a major hip operation. He needed some rehab to build his strength and confidence and within a few short months, both have improved incredibly. Stairs and hills no longer slow him down and he rarely favours his leg now. We were conscious of the further care Cheddar needed with recovering from surgery when we adopted him, but with a bit of rehab and lots of enjoyable TLC, he has recovered amazingly. I would encourage others to not look past those dogs recovering from surgery. Just like Cheddar, with the right care, they make a great recovery. If you are interested in adopting a dog like Cheddar visit our website dogshome.com/dogs to see the dogs available for adoption.